Smokers, beware: Smoke or no smoke? Daniel, at age 4, twelve years ago. His hands were too small for gloves so we tied the ends of his beesuit. We didn’t think of giving him an air filter mask! Smoke or no smoke? Good question. It surprises me that there are beekeepers who have completely forsworn smokers. Such quixotic folks ply their trade without smoke, believing (perhaps correctly) that a bee smoker invalidates the organic status of their honey. My father, about 40 years ago, smoking bees in Europe with his pipe. Chemicals from a smoker are potentially hazardous. Smoke from my father’s corncob pipe proved carcinogenic, at least after 66 years of piping caught up to him and he, at age 80, developed a tiny knob of cancer under his tongue. It was spotted early and removed before causing serious damage. He used his pipe (and a conventional smoker made by Dadant) for decades. Smoke became mixed with the food we ate at the family table, from my father’s pipe, not a barbeque. Honey harvested with a bee smoker probably wasn’t good for us, but it’s not likely to have been a major health hazard – at least based on the anecdotal evidence of the health and longevity of most of my immediate family. 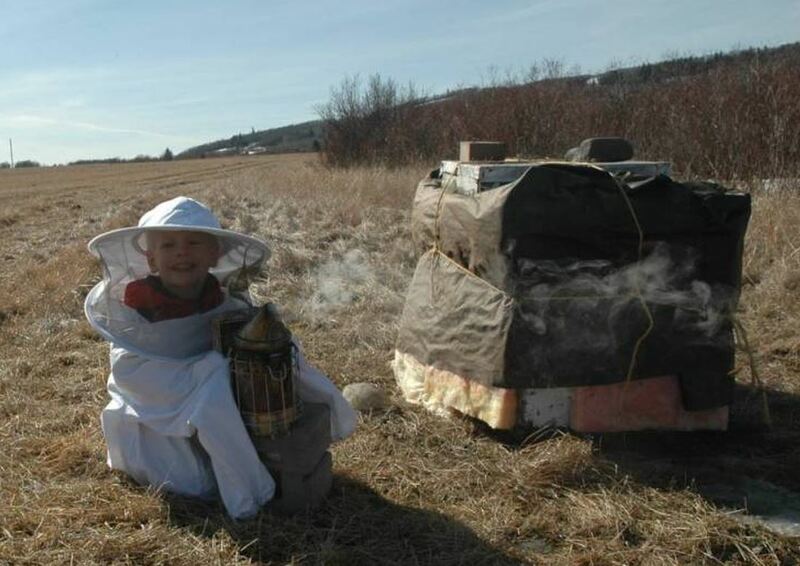 Still, some beekeepers are philosophically opposed to using a smoker. If you are considering working your bees without one, history is against you. Rather early, humans learned to carry smoky torches up trees when they liberated honeycombs from lofty wild hives. It seems rather obvious that bees evolved to peacefully turn over their honey to humans upon smelling smoke. What else would explain their docile smoke reflex? But some modern beekeepers have decided that they should work bees without smoke. That’s nice. But if you are not an accomplished, experienced beekeeper, I’d advise against it. A tiny amount of smoke, judiciously applied to the entrance before the hive is opened and along the top bars once or twice during your bee work is all it usually takes to calm the bees and allow a few minutes of personal bee immersion. Without smoke, the entire hive can quickly become unmanageable, stinging the beekeeper severely and possibly taking down neighbours in the process. I was once called to a house where the resident beekeeper had opened his hive without smoke, the bees erupted, and the beekeeper ran. I was asked to replace frames taken out by the fleeing beekeeper. He watched through his kitchen window. Bad ideas go up in smoke. If you’ve been working bees for a while, you may have become a smokerless beekeeper. If so, you should have learned how to pick the right weather to lift the lid, how to move smoothly amid the bees, and how to replace the frames and lid when the bees become seriously defensive, as is their custom. These skills are not learnt the first time a hive is opened, yet I’ve known bee-gurus who insist that their new, inexperienced disciples must never own a smoker. As in most things in life, balance is good. So is safety. For some gurus, this isn’t an option. It’s all or nothing. No smoke, they tell me, is the natural way to keep bees. Period. I’d rather see new beekeepers taught to use caution and smoke very, very gently than to totally eschew the calming effect of judicious cool smoke. I mentioned the inorganic nature of smoked honey. This is probably a valid concern. I don’t know how to address it, except to ask whether some of the beekeepers who imagine themselves as ‘working with nature’ could advise me. Please send me a note, I’d love to hear if you are a natural beekeeper producing organic honey even if you apply smoke to your bees. I guess it could be natural, organic smoke, sourced from the dried pods of organically grown sumac. I realize that some beekeepers are worried that smoke – even in tiny amounts – will hurt their bees. I appreciate the sentiment. Unfortunately, without smoke, any hive examination is precarious. When Betty Bee alerts Henrietta and Suzy who then alert their four best friends who tell sixteen more about an intrusion, hundreds of bees may go wild in a minute. The beekeeper may suffer a lot of stings. The key is to learn to use smoke in very carefully delivered doses. This is something learned from experience, though I’ll mention some tips in coming posts. So, I strongly recommend using a bee smoker (or corncob pipe). Next blog post (maybe tomorrow), I’ll write about lighting and using a smoker. We’ll also consider the many types of fuel. My favourite was pine straw but I don’t use it anymore – later, you’ll see why. Just a little smoke from a little smoker. This entry was posted in Beekeeping, Tools and Gadgets and tagged bee safety, bee smoker. Bookmark the permalink. 30 Responses to Smokers, beware: Smoke or no smoke? Your post is timely Ron. I was in my three hives today without smoke or veil or suit, checking on the level of the frame feeders. Working away, I was wondering if the bees “required” smoke or not. Did they need this smoke? Anyhow, in and out in a few minutes each hive without commotion. As for fuel, I have been using the waste paperboard egg cartons. Takes 1/2 a carton when I do light up. Thanks, Mark – I hadn’t heard of recycling egg cartons this way. And once more, you’ve cheated fate – no smoker in the bees! Well, if it’s a quick check and you know what you’re doing, then go for it. After fifty-five years in the bees, I still need to light a smoker every time. Yes please do a post on smokers and fuel. I’m new – and using pellets I purchased from a bee supply place. Difficult to get smoking and incredibly harsh smoke – if the breeze shifts direction when I’ve set it aside to work the hive – my eyes burn and I start coughing, and have to walk away. I smoke as little as possible – like you say, a puff at the entrance, a couple under the cover, and possibly once over the frames if i think I need to. I can’t imagine what the bees are dealing with – I know there are other fuels – but as a new beekeeper I’m not wanting to experiment while working a hive. I’ll write about the fuel materials I’ve had first-hand experience with and some other things folks have told me about. I would definitely quit using the stuff you’re burning now – the smoke should not be giving you coughs and eye burns! That’s OK. You have a lot of good points. Thanks! Thanks as usual for another great post. Yeah, I never go in a bee yard without a lit smoker.. I may not “need” it everytime, but it’s there in case things start coming apart. After getting my first couple of hives a number of years ago and feeling quite bulletproof in my bee suit , I decided to check on a hive. I can tell you that they didn’t go for that and mad bees have no problems finding ways up the pant legs of any bee suit or any other part of you they can inject with venom. When I was finally safe and inside the house, I found probably 100-150 stingers imbedded in my suit and fortunately fewer in me . After getting a smoker and using it, I have not been stung checking or harvesting the honey since. I use pet bedding that can be found in grocery stores or pet stores for smoking and I find it stays lit surprisingly long. Thanks, great message. Glad you had the veil and bee suit on! And thanks for the tip about pet bedding. I’m guessing that it has to be entirely non-toxic for bunnies and gerbils so it wouldn’t have glues and other chemicals in it. Should be fine for smoking bees. I’m also pet bedding! A huge bag of dust extracted wood chips costs £6 and will last me several years! Sounds cheap, clean, and practical. In Texas, lighting the smoker is done right afyer donning bee suit. Used coffee burlap bags as fuel with starter of paper that comes with foundation wax. Timely post Ron. On the heels of the spring season, when the bees have been easy and docile to work, we are entering dearth period now. Things change and the bees are testy. Regarding smokers: Better to have an not need than to need and not have. I usually use smoke, although I’ve tried working hives without it. I find my top bar hives are pretty tame without smoke. You only remove one frame at a time with a small open space where you are examining, so the hive stays pretty intact and they don’t seem to mind. With Langstroth hives, I am moving boxes around and the bees tend to take more offense. So I almost always use smoke on the box hives. I’ve seen folks advocate a sugar spray in lieu of smoke. Might not mask the pheromones but it would keep the bees busy cleaning up and reduce their need to fly. Could also be organic. I haven’t tried it so not sure how effective it would be for me. Look forward to your coming posts! I normally use a mixture of paper, wood pellets, and broken up dead tree branches in the smoker, and it seems to work pretty well. Thanks, Erik. There are certainly times when a smoker isn’t necessary, but I never know for sure when that will be, so I keep one handy. I’ve never worked with top bar hives (they don’t do well this far north) but I can see how they might be handled from the side without smoke. Thanks again for commenting. When we began we tried using a spray bottle of just water as recommended by some of the natural beekeeping folks. It did not work for us. Then we switched to spraying sugar water. It still did not work for us except to make everything sticky including ourselves. Then we switched to the smoker. It works for us. Most often we do not use it at all but having a lit smoker handy feels like buckling a seat belt. I love the buckled seat belt analogy! I’m a smoker! I started using egg boxes this season having always used hazel kindling before that. I got tired of chopping the kindling and find the boxes a cooler smoke the bees seem to prefer. My two smoker pails – a waterproof plastic for the newsprint starter, various (yard-picked when dry) fuels & lighter and metal one for the smoker itself – are the last things onto the truck and the first thing touched when the tailgate drops. Sounds good. Mo0re beekeepers should use metal smoker boxes. Okay, just shoot me… Wasn’t going to say this for fear of hurting someone’s feelings, but having a catastrophic experience for lack of using smoke is definitely more important. I was taught that making a pad of fresh, green grass is always the last thing done before closing the smoker for use: acts as a spark retardant, smoulders really well and cools the smoke as it filters through. Then, at the end of the day, the hot smoker is stored safely away in its covered metal pail to extinguish itself. Next time out, the now stone cold, semi-spent fuel can be used with a bit of starter (egg carton/ takeout drink carrier/ newsprint) to restart. Thanks, your smoker advice is really good. We know, of course, that a smoker is a good safety tool. I never work a hive without one within arm’s reach. It reduces alarm pheromone, masks human odours, causes bees to retreat, and makes them gorge on honey so they are less likely to sting. I have heard from other beekeepers that bees fill up on honey in advance of fleeing, however I’ve never heard of bees actually abandoning their home. Instead, they stay in the hive and burn. I think we like to assume they are preparing to flee with full tummies but that doesn’t seem to be their motivation. Guess it’s more likely a defence mechanism to all come rushing out at once. Trying to recall the term I’ve heard it called… Oh yeah, “Boil-over”. Always thought it sounded terrifyingly descriptive. Thankfully never seen it happen. That beekeeper who had to call you out while watching from the kitchen must have been dying with embrrassment. Bet he got a smoker after that.